I am sure this has been asked before but I have a question about braking for HO scale cars . So I have the trackmate power panels with the standard white black and red hookups . So what exactly does the red brake wire do . How does it work . The controller connects red to black when in the brake position. This connects the two terminals of the motor together. When that happens the motor works like a generator which slows it down quickly. This is sometimes called dynamic brakes. If a spinning motor is just disconnected it will coast to a stop, but will take much longer slowing down than with dynamic brakes. In a simple controller, the red connection does nothing once the trigger is pulled off the brake position. Most HO cars require no or minimal brakes. Many people simply leave the brake wire disconnected if they are using a conventional resistor controller. A more sophisticated controller would have adjustable brakes, that is usually done by adding a potentiometer or rheostat to the brake circuit. Some controllers have a switch to disable the brake circuit. Reduced or no brakes are quite commonly used in 1/32 and 1/24. Many of the more up market controllers have adjustable brakes built in. 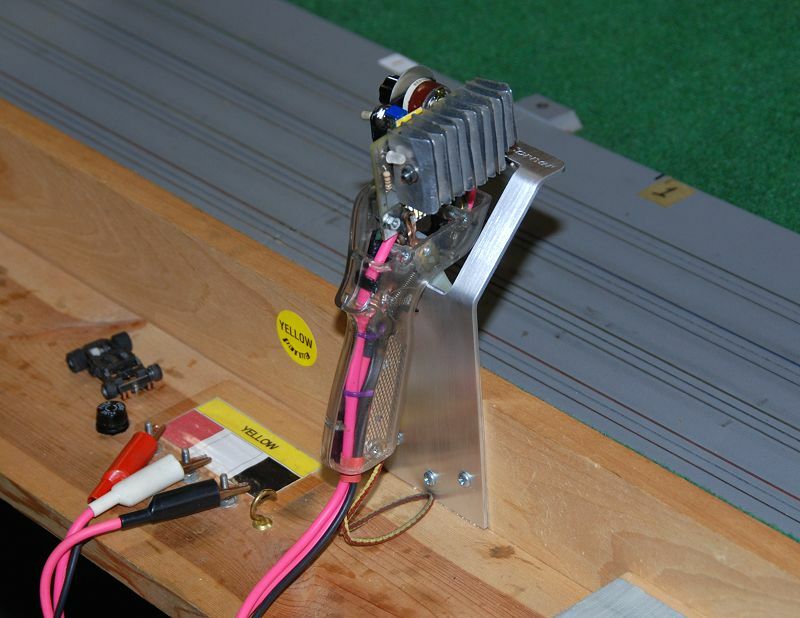 As Rich says "Many people simply leave the brake wire disconnected if they are using a conventional resistor controller." It might be worth mentioning that quite a lot of electronic controllers won't work if the brake wire is disconnected. To add to any possible confusion a few electronic controllers include a different type of adjustable brakes. Those controllers have a MOSFET (I think) in the brake circuit. When you let off on the controller full brakes are applied, the length of time that the brakes stay on is controlled by a pot. I have tried a controller with that feature, but not for a long enough time to be able to say that it has any advantage over conventional dynamic brakes. Indeed there are all sorts of more complex braking circuits available on some up market controllers. Some apply the brakes for an adjustable length of time, some apply the brakes till the car gets down to preset speed. In both cases the brakes work in the normal way with the motor working as a generator. Also some feed a small amount of power into the motor, this is used for cars that stop too quickly on no brakes. Different designers come up with different ways of doing those things, some used MOSFETs, others use bipolar transistors, others use diodes, some use more than one of those. Each of these features have their uses for some cars, and are not useful on others. It is easier to drive high downforce HO cars if you have a controller with a coast feature. With coast the voltage does not go to zero when the controller is in the brake position. A pot in the circuit controls that voltage. If you turn the pot up too much the car will not stop as long as there is track power. The same pot can be used to control the brake or coast feature if there is a switch to change modes. Often a three position switch is used with the middle position being neutral. You can add coast to any controller that has a brake wire, connect the brake wire to a pot and connect the pot to the white track connection. Something similar to what HO racers call the "coast" feature also appears in some controllers used for larger scales where for example one maker calls the feature "anti-brake"
The basics are the same - a small amount of power goes to the motor when in the trigger is fully released. The difference with "anti-brake" is that the power is only applied for a short length of time after which it reverts to no power. This means the car will stop unlike the "If you turn the pot up too much the car will not stop as long as there is track power" Rich describes. There are some misunderstandings over what "coast" means. Some racers (particularly HO racers) use "coast" exactly as Rich describes. Others use "coast" to mean disconnecting the brakes completely. Unfortunately this isn't the only term in slot racing that means different things to different people. I suppose that the "anti brake" version of coast uses a MOSFET much like the brake feature that I mentioned earlier. Can you say which controller has that feature? 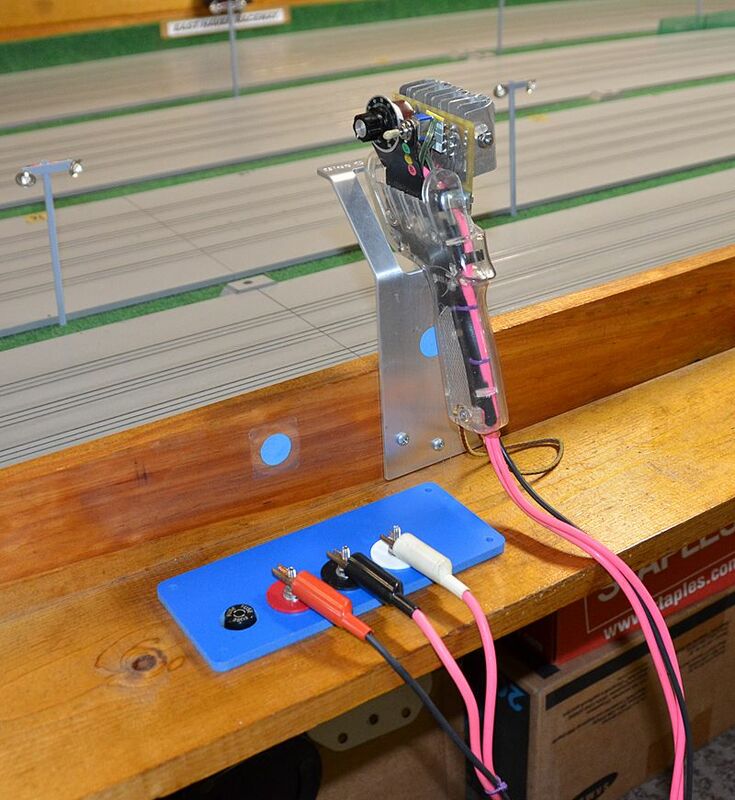 A long time ago I had written an article on slot car controllers which I have never made available on the Internet. That article is in need of updating and the subject gets complicated by the fact that the needs may be different for different scales. An article that tried to address all of those needs might be confusing to the reader. A further complication is that there are a lot of controllers that I have not tried personally, those might have features for which their makers claim great benefits, but upon testing them I might decide that those benefits are somewhat exaggerated. Synapse call that feature "anti-brake". I have seen others on various Facebook groups but Google doesn't seem to be finding them. I think Synapse use MOSFETs but that feature could just as easily be achieved using ordinary transistors. A further complication is that there are a lot of controllers that I have not tried personally, those might have features for which their makers claim great benefits, but upon testing them I might decide that those benefits are somewhat exaggerated. Trying to write a comprehensive guide to controllers is a very challenging ambition! It's not just a question of different scales requiring different controllers, but different types of car within the same scale having very different requirements. For example "anti-brake" can be useful of some types of 1/32 cars, but serves no useful purpose on others. I have only encountered a few 1/32nd cars that needed a coast or anti-brake feature, those were all proxy cars that either had binding issues or the wrong gear ratio. If I was designing a controller just for 1/32nd scale cars I would not include that feature. Any article that I might publish on controllers would contain more general information and would not contain actual reviews of specific controllers. I would include s specific reference only because it might be a good example of a particular type of controller or have a feature that I was referring to. If I ever get around to doing any new controller articles they would be limited to a certain scale. There are some types of 1/32 car (when running properly) where "anti brakes" can be an advantage - two very different types I know of are. Non magnet cars with some of the modern high reving motors. Last edited by Al's slotracing; 03-05-2018, 08:47 AM. I was thinking the same thing about cars with serious magnetic downforce until I remembered that our cars could often be run flat out around the track. That got to be boring and if a car did crash it was likely to get damaged. Indeed a vast increase in corneingr power without a large enough upgrade in motor power produces a car that's flat out all the way round. Brakes become irrelevant if the trigger is pressed all the way down all the time. The fastest 1/32 "magnet cars" I've seen have MUCH more magnetic grip and MUCH more powerful motors than home set magnet cars. These fast cars are not flat out all the way round, which is why "anti brakes" can be of some benefit. However, as far as I know, these sort of cars are fairly rare so it's doubtful there would be much market for a controllers specially designed to suit them. It appears that "anti brake" controllers were developed for 1/32 and 1/24 non magnet cars with modern high reving motors. These are much more widely raced, so I guess the controller makers thought there's a large enough market to justify controllers specially designed to suit them. I mostly use an old Cidex Omni controller with HO cars and that did not have either variable brakes or coast. I also had several transistorized controllers with variable brake and coast, so I knew that those features were useful. I added variable brake and coast to my Omni controller, only two parts were needed, a 175 ohm rheostat and a 3 position switch.